We’ve teamed up with one of our favourite designers, Lisa Glanz to bring you an incredible new font family called Salt & Pepper! This new font duo will take the guess-work out of font pairing, and have you whipping-up fabulous designs in minutes! This lovely smooth script also comes with a unique gritty version, giving you more versatility. Included with the script are some handy ornaments, stylistic alternatives and decorative swashes – a recipe for design success. Not to mention some juicy extras, you’ll receive over 60 graphic elements to kick-start your next project. We’d love to see what you create with this set! Software Compatibility: The vector files will work with Adobe Illustrator CS3 or newer. .PNG files can be opened with most photo editing software – please check your software for compatibility. To create seamless patterns using the supplied master tiles, Adobe Photoshop is required – these are also supplied as 12”x12” .JPEGs if you don’t have Photoshop. File size is approx 59.7MB (68.8MB unzipped), offered as a single download. Amazing! I’d like to know… can i use this font on Photoshop? Thank you for your comment! I’m happy to report that Salt & Pepper will absolutely work for you in Photoshop once it has been installed on your computer 🙂 if you do need any assistance with this, please do let me know and I will happily lend a hand! I hope this helps, and please don’t hesitate to contact me should you have any other questions. I’m here to help! Thank you so much for your kind words, Sheri! You are in good company, we are huge fans of Lisa as well 🙂 I hope you enjoy working with her resources! Hey guys, just downloaded this beauty, but in the help files you don´t explain how to do the lower case swashes, i already tried on Photoshop CC and Ilustrator CC… please help! I hope it helps, and please don’t hesitate to contact me should you have any other questions. I am always happy to help! Hey, I downloaded Salt &Pepper when it was first offered – I can use it in Illustrator – but it will not work in Photoshop … it won’t display the separate characters … HELP!! Thank you so much for your comment on this post and thank you for your purchase of Salt & Pepper! I am really sorry to hear that you are experiencing using your new resources in Photoshop. I have just sent you over an email to get some more information from you on this one. I hope this helps and please don’t hesitate to contact me should you have any other questions. I am always happy to help! thanks! I just got it and replied … thank you so much! forgot you are in London!! a little time difference! No problem, Aneesah! If you have any other queries please do let me know. I’m here to help! I’m having the same issue – the only version that displays in Photoshop Elements for me is the Ornaments. Could someone help me figure out how to get the fonts working for me? Thank you! Thanks so much for your comment and I am really sorry that you are having issues with this! Thank you so much for your comment, I am really pleased to hear you are loving Salt & Pepper! I am so sorry that the piece of cake you were after is not included in this pack, I would hate to see you stuck so I have reached out to the designer on your behalf to enquire this item. Once again, I am so sorry for any disappointment, Brandy. Rest assured, I am on the case to look in to this further but if there is ever anything else I could assist you with please do get in touch. I’m always happy to help! Brandy Lipscomb, thank you for mentioning this 🙂 I too had eyes on the cake and the stand as it looked like it would be included in the pack… just too cute…I have my eye on this but also would have been gutted if not included. Thanks so much for coming back to Brandy’s comment here! I hope this helps and my sincerest apologies for any disappointment caused. Great and very beautiful set! No Russian Cyrillic? What a pity! I always love Lisa’s work! They are amazing! I always get so inspired to start creating with them! Thank you Lisa and Designcuts for again and again deliver so much quality! Thanks so much for you lovely feedback- that is so awesome to hear Lisa’s work inspires you! We are huge fans of hers in DC HQ and it was so lovely to be able to feature this font for Lisa :). We hope you get loads of use out of it and please do feel free to share anything you create as we would love to see what you are working on! LOVE LOVE LOVE – I grabbed it when it was announced, but only now took a really good look at ALL that is included. WOWEE!!! THANK YOU Design Cuts and Lisa Glanz for this wonderfully creative beauty! It’s lovely to hear from you, thank you so much for leaving a comment! Again, you made my day…..this is outstanding! Thank you so much!!!! Thank you for making my day by leaving such a lovely comment- the whole team and I really appreciate your kind words. Oh no! I literally missed the introductory price between adding it to the cart and checking out!! Serves me right for procrastinating! I am really sorry to hear that you missed the introductory discount on this, it was only available for 24 hours after the release of the new font! Oh don’t worry, I often have those Hamlet moments myself so you are not alone there :). If there was ever anything I could assist you with please do get in touch. I’m always happy to help! Thanks SJ for reaching out! No worries, I am still going to get my paws on this goodie and some other cool stuff you guys have once I can narrow it down to a reasonable few for my wallet’s sake! Problem is, every cool resource I see, I have a million ideas that come flooding and I want to start working on them right away–so it is really hard to pick an choose. Need an organizer for my brain! WONDERFUL! Thanks so much, DC! Wow thank you Kelly :). You are more than welcome! We are just so pleased that we have been able to feature this! We are so pleased you are loving Salt and Pepper and hopefully you will get loads of use out of it :). Wow a 100 star review has left us speechless over here :). We hope you get loads of use out of your new font and please do share anything you create as we would love to see what you are working on! Yay thanks Siti, that is awesome to hear :). My five stars didn’t attach cos I kept clicking them countless times. Hahaha! You are so kind to add your rating- thank you :). We love you an infinite amount too and we are so happy to have you as part of our community! You are more than welcome Tina! Thank you for your lovely feedback- it is hugely appreciated :). If ya didn’t already LOVE Lisa’s work, her vid is toooo delightful!! My gosh, no limit to her talent. Yeah, I’ll get it. Not really a fan of script fonts, but hey, how can I pass this up? Thanks DesignCuts, you rock as usual!! Hopefully you will get some use out of this for future projects and thank you for your purchase! In our eyes you are our ultimate (punk) rock- star! The Salt and Pepper font by Lisa Glanz is absolutely beautiful! Great combination of script and sans-serif type! I LOVE that it supports international characters (espacially that the German letter “ß” is included!). The bonus goodies are great, too! Very versatile. Everything is AWESOME! Yay! Thrilled to hear that the German characters are helpful 🙂 So glad to hear you are enjoying the extra goodies too! Thank you so much for your kind words- we are so pleased you are enjoying everything! Hopefully the international characters will come in handy for your projects :). Stunning font and so on trend. A great looking script font with a perfect sans serif to pair it with – a great time saver! Nice touch with the simple and textured versions too. Love it! Thanks you for the awesome feedback and we are so pleased you are enjoying Lisa’s latest font! We hope you get tonnes of use out of it with all your future work :). Thanks Lisa Gland, it’s amazing font! Special price and extras. Two birds, one stone. We are so pleased that you like Salt and Pepper and we totally agree with you- it is really cute :). We are so happy that you managed to get this on the introductory price as well- happy designing! SO beautiful. The talent you have is unmatched. Thank you for sharing your gifts with the world! Thanks for the fab comment on Lisa’s work- we are so happy you love the font! Amazing font at an amazing price! Bonus goodies are fantastic!!! Thanks for the awesome comment! We are so pleased you managed to grab this at the intro price :). That is great to hear you are enjoying the bonus items as well- hopefully you will get loads of use out of them! That is great news to hear you are enjoying this and it sounds like we released this at the right time for you :). I mean you guys can’t help but amaze us each time!! I love this cooperation, it’s amazing! 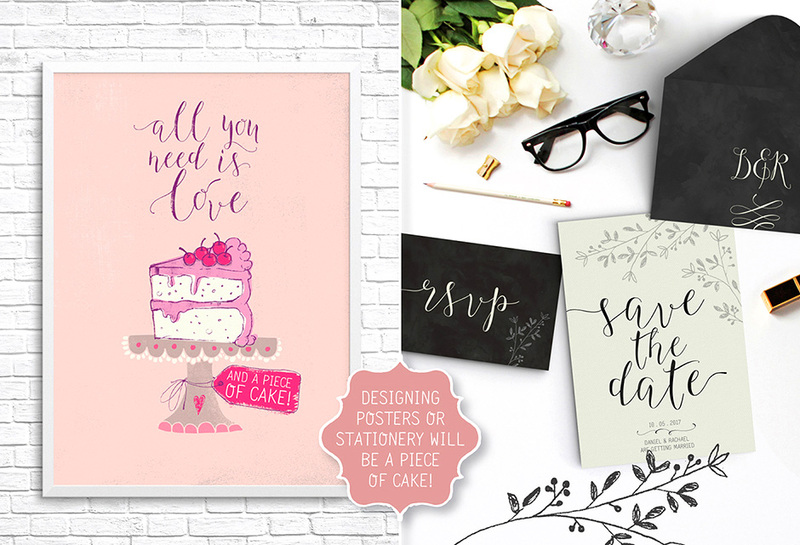 Lisa Glanz and DesignCuts are a match made in heaven. I don’t think can stop playing with the new fonts. And do I need to mention how happy I am for the “Juicy Extras”! they are wonderful. From the heart, Thank you guys!! Thanks so much for your lovely feedback- we absolutely adore working with Lisa! From the bottom of our heart- thank you for your purchase! I hope you are having the best time working with your fonts and please do share anything you create as we would love to see your work with your new goodies :). You guys. Thankfully, I have been able to convince my husband my font addiction is an investment since I use the fonts for my etsy shop! bought this and TWO other fonts today because I can’t resist. THANK YOU for making it possible to make our own bundles! So exciting!!! now excuse me while I go hide my credit card from myself…. Oh Constance, your comment has made me laugh! I am so glad that I am not the only one who has to hide the credit card :). Thank you so much for your purchases and I hope you get loads of use out of your new toys! I would love to see your Etsy shop Constance so please do send a link over, if you like, so we can check it out! If there are ever any fonts that would help with your work and that you would love for us to feature, please do let us know! Lisa is never disappointing! She is such a talented lady! Great font, as always. 10 stars out of 5. Thank you so much for this 10 star review- wow! We totally agree with you- Lisa is incredible :). I LOVE this set! Lisa is a combination of brilliance and perfection, Thank you!!! You are more than welcome Colleen and we absolutely adore this set ourselves! We hope you get loads of use out of it! Thanks so much for your comment and we are so pleased you like the look of this one! I am so sorry to disappoint you about the Russian support- we are continually trying to increase our language coverage so this is something I will raise with the team. Thank you so much for your feedback- we are so pleased that you like this one! I know SJ came back to you about your bundle request and I am so sorry we weren’t able to help with that. PPS: Can you guys bring her Caboodle dingbat font to your marketplace too, please? Finally! I’ve been refreshing the page since I woke up this morning! I can’t wait to dive in and play with this little beauty and the freebie kit. Lisa and the Design Cut team have out done themselves! We are so pleased that you are loving the font and we are so sorry that we had you waiting but hopefully it was worth it for you :). Happy designing with your new font!